In designing your loved one's funeral, first, we ask you to consider how you wish to honor and celebrate the life, then we’ll turn to the issue of what type of service your loved one wanted, whether it be a traditional service or a memorial. After experiencing the loss of a loved one, naturally, you want to be surrounded by family and close friends. It’s about bringing those you love together during this emotionally difficult time. Customarily, it has become a socially-expected practice to gather together, using each other as a support structure. More importantly, a funeral or memorial service, whether traditional or contemporary, is the first step in the healing process. 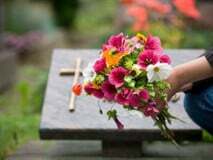 At this time, start thinking about where and when you want the celebration of your loved ones life to take place. It's important to decide the day of the week, time of day, the eulogist/clergy participating, prayers, musical selections, persons giving reflections or tributes. In other words, anyone that would be participating in the service. We’re here to help you create the most memorable and meaningful service honoring your loved one. When choosing between burial and cremation, usually, people are clear on this point. In fact, your loved one may have told you, or someone else, exactly how they wish to be cared for. But it can be a difficult decision for some families, especially when the wishes of the deceased were never clearly stated. If that's the case, please know we're able to help you in the decision making process by explaining the various entities for burial and cremation for your loved one. Now that we've given you the basics, it's time to reflect more on exactly what is appropriate for you and your family. If possible, now is the time all those involved in the decision making process come together to speak of their feelings and desires. Speaking with a professional funeral planner will help to clarify any questions you may have or if we don't have the answer, we will direct you to someone who does . Reach us in the Columbia office (803) 786-6300 or the Sumter office (803) 773-3381.